Lindan Village is a luxurious property located opposite the Lardos Beach in Rhodes. 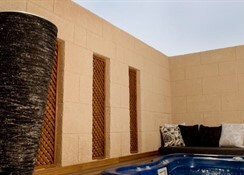 Featuring a lush garden, a private beach, inviting pools, a spa and a state of the art gym, the hotel is truly lavish. The elegant rooms and suites offer splendid views of the coast, and come with all the necessary amenities. Premium rooms come with their own private pools and hot tub. The spa houses the indoor swimming pool as well as a hydro massage pool, a sauna and Turkish baths. The five onsite restaurants take care of your gastronomy requirements. The bars serve a variety of cocktails, wines, spirits and beers. The Lindan Village offers an expansive range of facilities to its guests – including baby-sitting, personal training, personal shopping and a shuttle service to the airport and tourist attractions. 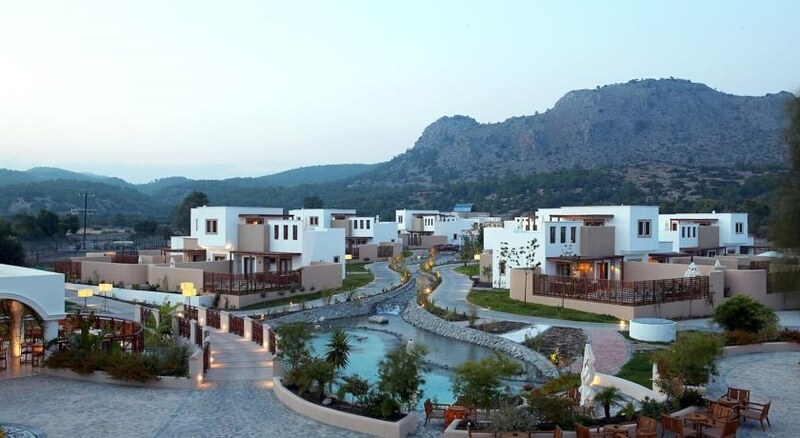 Situated in Rhodes Island, the Lindan Village is a traditionally Greek looking resort with its low rise white buildings and palm trees. Located opposite the beach, the hotel’s guestrooms offer excellent views of the sun, sand and sea. Local attractions close to the hotel include Glystra Beach, Stafilia Beach and Sabinas Watersport Rhodes – all within a few hundred metres from the hotel’s doorstep. The Rhodes International Airport is about 55km from the hotel. 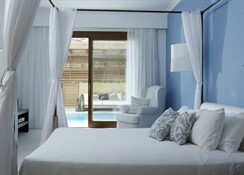 The Lindan Village boasts of 146 guestrooms and suites, all featuring an Aegean theme and décor. The rooms come with their own private balconies or terraces offering impeccable views of the coast and beyond. Amenities in all the rooms include closet & writing desk, daily maid and turn down service, direct dial telephone, dressing mirror, individually controlled air conditioner, in-room Wi-Fi, kettle (tea/coffee facilities), en suite bathroom with bathtub or shower, 24 hours’ room service, safe deposit box, satellite 32’’ LED TV and wake-up call. The five onsite restaurants serve traditional, international and continental cuisines. The cosmopolitan Almante’s restaurant offers Mediterranean and international cuisine; Basil is the hotel’s gourmet restaurant; Mr Danton serves Thai cuisine; Astroscopus is the al fresco restaurant boasting a massive wine collection; Kohilo is the poolside restaurant offering salads and juices. The bars on the property include La Piazza – a lounge and café bar, Sea Spirit – a poolside bar serving delicious cocktails, Pebble pool bar offers freshly made margaritas, mojitos and a spread of light bites. The Lindan Village offers a wealth of sport, game and entertainment options to its guests. The state of the spa houses the indoor pool, a hydro massage pool, a sauna and Turkish baths. 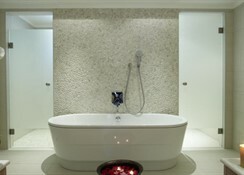 Guests can choose from numerous massages and therapies. There’s also an all-weather tennis courts that are adapted for other sports as well. The private beach is where you can indulge and enjoy several water-sport activities including sailing, waterski, wakeboard among others. Guests can also take yoga, Pilates, Tai Chi and belly-dancing classes.